A large area of bare soil on a steep, high shoreline bank. A measureable change of the shoreline over a period of time. Leaning or downed trees with exposed roots on the shoreline. Large patches of muddy water near a lakeshore, or unusually muddy streams during periods of high water or following a rainstorm. 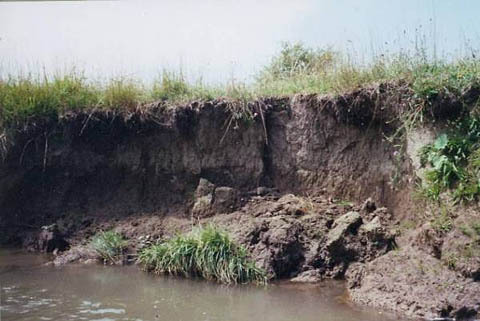 Excessive deposits of sand or other sediments on the stream bed, or very wide, shallow areas in a stream. How can shoreline erosion be controlled? Preserve the rocks and vegetation which naturally occur along the shoreline. Prevent impervious surface (i.e. roofs, driveways) runoff from flowing to the shoreline, especially bluff areas. Avoid construction within 100 feet of the shoreline or the edge of nearshore bluffs. Protect nearshore berms along lakeshores. They prevent excessive surface runoff and trap sand which "nourishes" the beach. Limit the amount of foot traffic and other recreational activities in erosion prone areas. Regardless of preventive measures, the right combination of conditions (such as high water level, violent windstorms, drastic water movement, and certain shoreline configurations) may result in serious shoreline erosion. Vegetative/No Mow: This method involves encouraging or planting trees or woody shrubs for the soil binding properties of their large root systems, grass and other herbaceous plants to protect against raindrop impact and scouring from surface runoff, or emergent aquatic plants to stabilize bottom sediments and dampen wave action. Structural: This includes protective structures. The placement of rock of various sizes (referred to as rip-rap) has traditionally been most common method. Other structural methods include bulkheads, gabions (rock filled baskets), and railroad ties. However, these other methods are often visually unappealing, require more heavy equipment and technical expertise, and may be more prone to failure in comparison to simple rip-rap. Manipulative: Mostly used on streams, this includes removing streamflow obstructions, grading shoreline banks, or, in special circumstances, rerouting the stream channel.